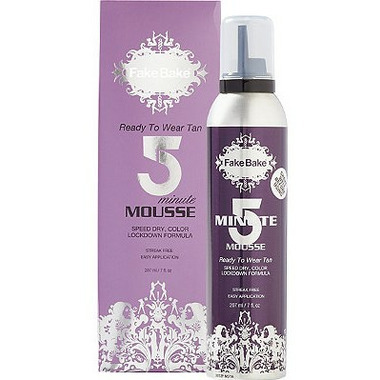 Dubbed ‘The Party Tan’, Fake Bake’s 5 Minute Mousse Self-Tan with its super-quick, speed-dry formula is your secret weapon to transform yourself in just 5 minutes whatever the occasion. Nobody likes to be late for a party and when cocktails are calling this top NEW product will take you from poolside to party or desk to dance floor in a flash. The perfect partner you can truly rely on, this non-transfer formula means your new golden glow stays put keeping your whites bright. Underneath the believably bronzed instant color, a long lasting tan will continue to develop, ready to be unveiled when showered off - leaving you looking just as fabulous in the morning as you did the night before. Fake Bake’s 5 Minute Mousse brand NEW ‘color lockdown’ formula gives an instant, deep, luxurious color for a tan that is ‘ready to wear’. Simply apply, dry, dress and go! Perfect "ready to wear" tan. Instant luxurious deep bronze color. Cutting edge "color lockdown technology"
Lightweight, super-fast drying self-tanning mousse with non-transfer formula. A natural golden glow continues to develop with long lasting results. To use: Shake well before each application. Always wear gloves enclosed. Should be applied to clean skin free from oils, perfumes and deodorant. Suggested use of Fake Bake Scrub before using to remove any dead skin cells to achieve a smooth eve tan. Dries fast so apply in one are at a time. Apply in a circular motion and if you miss a spot, re-apply over the area. You can apply a second application if you desire a darker tan. Buff skin lightly with a dry towel before dressing. When showering you may notice a small amount of color washing off but your tan will remain. Warnings: Flammable. Contents under pressure. Do not place in hot water or near radiators, stoves or other sources of heat. Do not puncture or incinerate container or store at temperatures over 50 C. Do not use in presence of open flame or spark. For external use only. Avoid contact with eyes. Do not use on children. Keep out of reach of children. This product does not contain a sunscreen and does not protect against sunburn. Patch test required if first use of a self tanner. Apply on inside of arm -wait 24 hours- if irritation occurs discontinue use. Do not apply to damaged, irritated or sensitive skin. Product should be used within 10 months from opening for optimum potency. Note: can be refrigerated for extended shelf life.